Education and Extremisms addresses one of the most pressing questions facing societies today: how is education to respond to the challenge of extremism? It argues that the implementation of new teaching techniques, curricular reforms or top-down changes to education policy alone cannot solve the problem of extremism in educational establishments across the world. 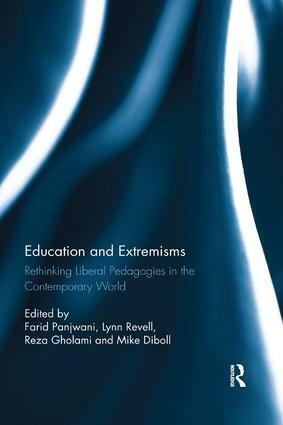 Instead, the authors of this thought-provoking volume argue that there is a need for those concerned with radicalisation to reconsider the relationship between instrumentalist ideologies shaping education and the multiple forms of extremisms that exist. Beginning with a detailed discussion of the complicated and contested nature of different forms of extremism, including extremism of both a religious and secular nature, the authors show that common assumptions in contemporary discourses on education and extremism are problematic. Chapters in the book provide a careful selection of pertinent and topical case studies, policy analysis and insightful critique of extremist discourses. Taken together, the chapters in the book make a powerful case for re-engaging with liberal education in order to foster values of individual and social enrichment, intellectual freedom, criticality, open-mindedness, flexibility and reflection as antidotes to extremist ideologies. Recognising recent criticisms of liberalism and liberal education, the authors argue for a new understanding of liberal education that is suitable for multicultural societies in a rapidly globalising world. This book is essential reading for academics, researchers and postgraduate students with an interest in religion, citizenship education, liberalism, secularism, counter-terrorism, social policy, Muslim education, youth studies and extremism. It is also relevant to teacher educators, teachers and policymakers. "This book brings clarity and criticality to a complex and vitally important question: how can education prepare educators, school children and university students to live as revitalised active citizens? A strong team of thinkers and practitioners contextualise their proposals for action within a national and international framework. They challenge existing state ideologies and insist upon the capacities of education to teach us how to understand that pervasive truths may be provisional, that good education explains but may not resolve dissonant views and that tolerance must be active and critical. I recommend this book very warmly for its conceptual analyses and practical solutions to the labour of being critical, liberal and democratic." Farid Panjwani is a Senior Lecturer and founding Director at the Centre for Research and Evaluation in Muslim Education (CREME) at the UCL Institute of Education, University College London, UK. Lynn Revell is Reader in Religion and Education at Canterbury Christ Church University, UK. Reza Gholami is Lecturer in Sociology of Education in the School of Social Science and Public Policy at Keele University, UK. Mike Diboll is Honorary Research Associate at UCL Institute of Education, University College London, UK.